Come For a Picnic or a Barbecue. The Learning is Free. We have palm frond furniture all over our gardens and you are more than welcome to bring your lunch to enjoy in the garden or to bring something to grill and side dishes. If you call in advance we can help out with salads and other freshly created dishes for your enjoyment. The barbecue is fully equipped with charcoal, grills, and tools, and its use is free with admission. Our farm is run on North American standards, so you can be sure the cleanliness, safety, organization, and training of staff members are our top priorities. Our animals are extremely well-trained and cared for, so anyone can handle them safely, even novices. It's important for veterinary students to get hands-on training. We offer instruction here to help teach them how to deal with and care for farm animals. 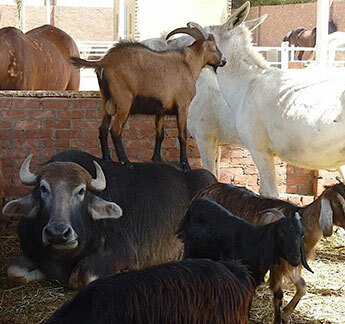 The students we work with rarely see healthy animals in their educational training, and this is an excellent opportunity for them to interact with our friendly stock. We have a class room for workshops and classes that are held by other animal welfare organisations in Egypt and by visiting doctors and professors. With friendly animals, this is a wonderful chance for young people who think that they might like to go into animal studies to interact with animals and see how comfortable they are with them. Organically grown produce is an important part of diets all around the world, and organic farming is important to our staff. 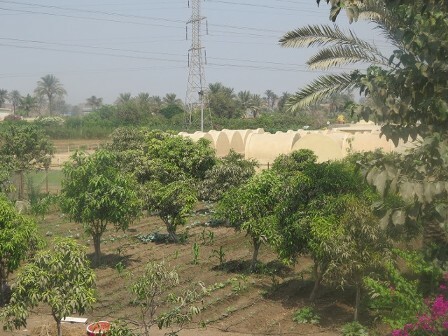 Here, we import seeds of new fruits and vegetables to grow them in Egypt. We introduce these foods to people in our classes by offering them with our lunches. Our agricultural activities have expanded, and we now provide cheese-making classes in the fall. There is no limit to what you can learn at Al Sorat Farm. Our clients come to us from all over the world, although we do bring cute baby lambs and goats to schools in Cairo upon request. We have clients coming from Alexandria, and many expats bring visiting family and friends out here for a safe riding experience or just a day away from the city of Cairo. We are 1.5 kilometers south of Sakkara Country Club on the last asphalt road that runs parallel to the edge of the Sahara Desert. The farm is marked on Google Earth®, and we suggest that first-time visitors use this and ask Google for directions at Sakkara Country Club. Then look for Al Sorat Farm, or ask any local resident where Maryanne's farm is in Arabic. Yes, this is a bit informal, but it works. Please note that Google Maps GPS service takes people down dirt donkey trails if the farm is used as the initial destination. We are between Abu Sir to the south and Shabramant to the north and just north of the pyramids of Abu Sir.